aka too big to do anything useful. So while most western countries are running from checks as fast as they can, some have even announced the end of checks/cheques as we know them, the US is not only persisting with the check model and clearance process, they are making ATM’s better at accepting checks and spending money to promote it. Meanwhile, I can login to my UK Bank, and for free, transfer money to my Son in Berlin in a different country, and different currency and it is in his account in about an hour. To send money to people in the UK, it’s even quicker, less than 15-minutes on average. I’ve had the account for nearly 15-years and not had a checkbook for the last 12-years. The easiest, simplest and by far thecheapest way for a person in the USA to send me money is to write a physical check, take a picture of the check on their cellphone, and email me the picture. I remote deposit it in either of my USA Bank Accounts. Way to go USA. Another frustrating, and wasted effort trying to deal with my FCU over online/electronic payments. I tried to set up an online payment to pay my Attorneys. They gave me all their banks details and double checked they could receive online payments. I went online entered my Attorneys details, it asked for the account number but not the ABA Routing number. I asked online via chat and then in person while at a branch doing a wire transfer today, both reps from the bank confirmed that when I made a payment, the payment would generate a check; the check could be mailed either to the bank, or to the attorneys office depending on what address I used. I got back on chat, to keep a record, and ask the agent, Shannon about Bill Payer. She insisted it was a dept of the bank rather than a 3rd party service, gave me a number to contact them along with a 5466 extension. I repeatedly asked for the name of the person who owned the relationship with Bill Payer, she insisted it was a dept and I call them. I called, the extension I was given wasn’t valid. I called the FCU, spoke to Cindy. Asked the same question, she said that extension was internal use only; said it was a 3rd party provider and gave me a 1-888 number to call. I called, it turns out at least after a long validation that it is indeed a dept. of the bank, or at least that’s what the woman who answered said. She was unable to actually help with a list, frankly either because of my accent, or for some other reason, she kept saying OK sir when I asked questions. Finally I specifically asked if she was an FCU employee, she said she was. When I asked what service the FCU used for their Bill Payer service, she didn’t seem to understand the question, and said I see, OK Sir. I asked again, saying is it checkfree or similar because the FCU wasn’t listed on their website. I really want to be wrong about this and have written to the FCU Vice President – Information Technology and Software Development. I’m afraid otherwise I need to go back to one of the big banks, which be a real shame. The Planet Money podcast has a great summary of the topic I was frustrated and grumpy over about 15-months ago, the US Payments clearing system, known as the Automated Clearing House. which I discussed in a follow-up comment to this post. Except, they really didn’t get to the bottom of the problem. I wrote in a comment on their facebook page, here, but figured I’d post my comment here as well. “I was excited to hear this and actually set aside time to do it via the podcast. Your description of the problems and the explanation of the ACH was right on the “money” but then you let it slip through your hands. Yes, the US System has a scale issue compared to the UK. But does the US system have problems with credit cards? No. Which is a much, much larger scale. The difference is with credit cards the banks are lending us money, with bank payments they already have our money so it’s in their interest(pun intended) to make it hard for us. You really dropped the ball when you got to the end of the piece and discussing local banks. It’s as if you accepted that local banks and financial institutions don’t have computerized records, they still pay people to write entries and process checks using ledgers. So, as I pulled into the drive through ATM at the Amplify Brockton Branch yesterday to deposit two checks, worth combined less than $2, something grabbed my attention out of the corner of my eye. 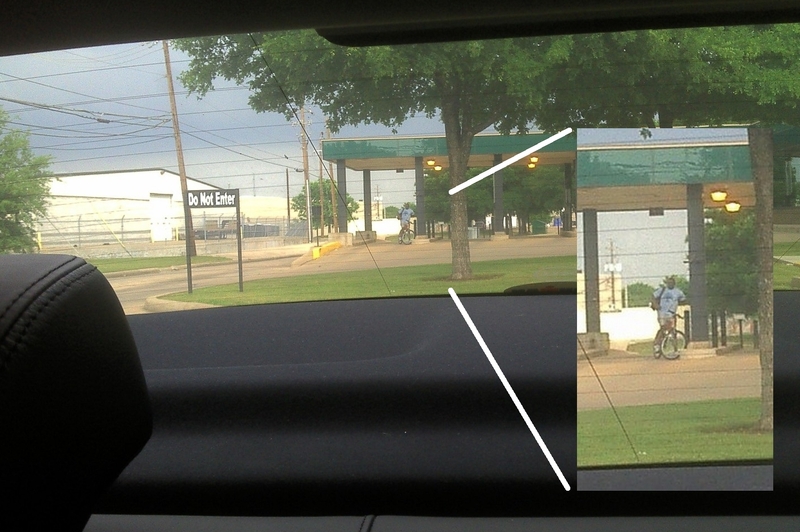 Yep, there was a guy on a bicycle in the drive through bank. Apparently it’s not all that uncommon, all I know is I laughed hard until I started to try to deposit the checks. Here is a zoomed version. I’ve got one of those CapitalOne No Hassle cards, instead of getting worthless points, I get cash back based on how much I spend. I can use that “cash” on the same sort of useless purchases as I could with worthless points, or I can request a credit in my CapitalOne card account, or, yes, a check. 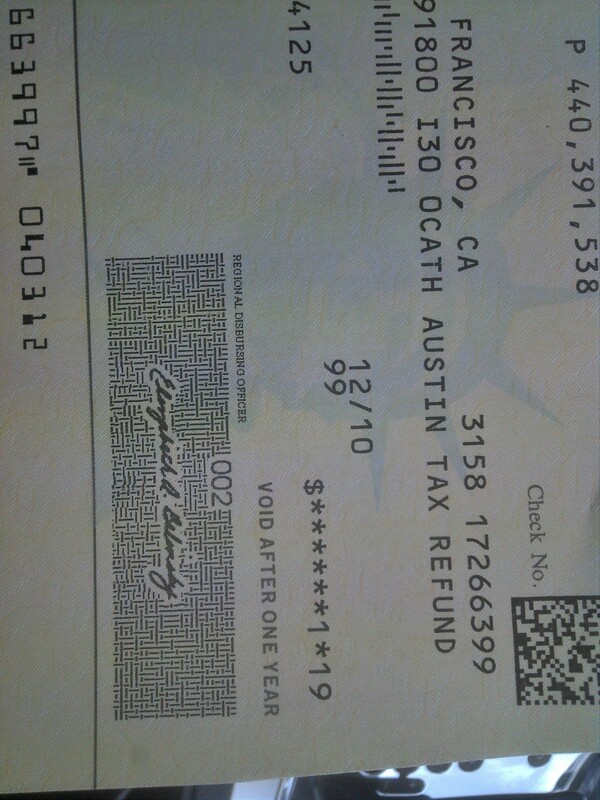 I elected to just get the credit, $67.18 as an account credit. I guess they send themselves a check, after all an electronic transfer couldn’t take 5-7 business days, could it? I continue to be amazed, saddened and I some ways angry about the inefficiencies in the US Banking system and the inability for big financial institutions to see how much this is costing the economy. I’m sat in line for a drive up teller, coz the bank closed at 4:30 or 5pm, whatever, that’s not the point. The point is I have two checks to deposit, one for $0.07 from an IBM Share account I thought I closed 2-years ago, and the other, as attached my US GOVERNMENT TAX refund. You’d think the government would save its money and the banks by just carrying this amount as a credit into the next year, or at least do a electronic credit. I could just rip the check up and let the government have the money but it doesn’t work like that in account the money just gets held in a suspense account for nearly ever. As much as Amplify have been really helpful, their inability to do electronic payments to accounts outside the bank has got me to the point where I think it’s time to move again. I just never realized how inefficient their processes were, how they were totally dependent of printed checks and that’s all just too slow for me. Back in the UK at FirstDirect I can logon, enter an account number, routing code(for the bank), amount and date and in many cases the transfer is done electronically, often simultaneously and always within 2-hours. At Amplify, I have to use the pay-a-bill system. 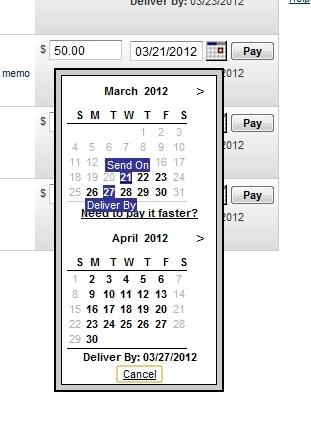 Essentially this with a few details, allows me to tell them to print and mail a check. So for example, today I logged on, had to enter a name, a full postal address, and only the account number of a payee; then I entered the amount of the payment, and could select the day I want to send the payment, I chose today. Low and behold the system informed me the payment would be received on March 27th. Note in this instance when they mean received, what they mean is a check would be received on 3/27, they couldn’t mean anything else since they didn’t ask for a routing number for the receiver. My alternatives were Overnight check – $18.95. Yep some how they were charging me about $12 for them printing and handing my check to USPS for next day delivery, or some other courier company. The only other option is to do a domestic wire transfer, cost $15. So I’m looking for other responsible banking options., None of the big international banks, ideas anyone? This seems to be another area, like cellphone plans and cellphones in general where America is gradually has little more than a 2nd rate service. Which really is a shame. Anyone got any insights into why?